When you try to make a connection with a potential business partner, there is only a small chance you will reach the person you want to talk with directly on the first try. If your job is to find prospects or close deals, chances are that you are going to spend much of your day trying to reach your intended contacts, and not much of it in actual conversation. 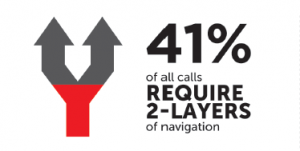 In fact, 41% of calls require 2 or more layers of navigation to determine an outcome, and it’s not always the outcome you were looking for. It’s time to try something different. The ConnectAndSell solution combines best-in-class technology and a human touch. Together the two parts provide conversations quickly and offer a seamless transition from our platform to your conversation. The first part of the solution is our cloud based software that begins the outbound call process as soon as you log-in. You can access your contacts directly from our platform or from your own CRM system. 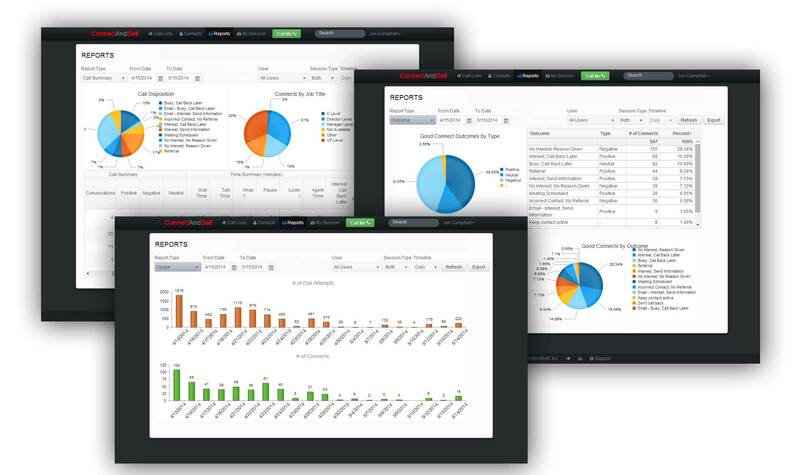 ConnectAndSell integrates seamlessly with SalesForce, Microsoft Dynamics and other CRM systems. Our technology does the dialing. But still, 97% of the people you ring will not initially pick up the phone. So, the ConnectAndSell solution includes a global network of highly trained agents who will work as your virtual assistants; navigating gate keepers, IVR’s, phone trees and other obstacles to talk time on your behalf. Our skilled agents are trained on call strategies designed to get your targets on the phone, all the while representing you and your organization with courteous professionalism. ConnectAndSell agents never speak to your prospect. Once your prospect says “hello”, you are injected into the conversation in a fraction of a second. When you are ready to begin having conversations, fire up ConnectAndSell then sit back and watch for a few minutes as we dial multiple numbers on your calling list. The connections are made in parallel, meaning our technology is doing the dialing while our agents are navigating phone trees for multiple contacts at one time. Simply load your calling list, dial into a phone bridge, and click the “Go” button to log into your ConnectAndSell session. Wait a few minutes while our conversation generating engine does its thing. When someone on your list answers, you hear a tone and see their contact info – instantly – and you’re in a conversation. While you are on a call, other connection attempts cease. When your discussion is complete, update the contact records and notes like you always do in your CRM. Then, when you are ready, hit the “Go” button again. 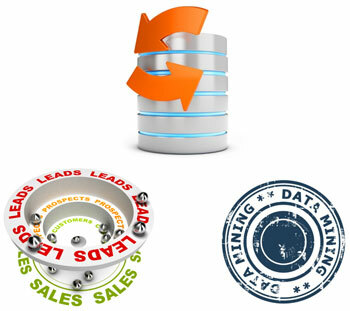 Your contact record updates are automatically passed from our platform to your CRM database. When your session is complete you will get a report showing you all your connections. This helps you see what is working and can help you make adjustments to your call lists and your technique. On the other end of the line, it felt the same as receiving any point-to-point call. And, you set the number for the caller ID. So you control what is seen before the call as well. Predictive dialers can appear to be low cost at first glance. But, sales agents waste valuable time dealing with IVR’s, gatekeepers and voice mail boxes and still aren’t guaranteed an actual conversation. Having outsourced agents dialing manually for you overcomes this hurdle but it is cost prohibitive and does not scale due to the challenges of having to schedule it ahead of time. The ConnectAndSell platform is a cost effective SaaS solution that guarantees you a live conversation with one of the leads on your list and has the flexibility to change along with your business needs. ConnectAndSell is designed to expediently and cost-effectively connect B2B sales reps with hard to reach decision makers. We can help you take your business to the next level. ConnectAndSell’s proprietary technology is protected by US patent 8,649,500 B1. Does not require you to schedule your calling sessions, call anytime during service hours! ConnectAndSell for iOS is a brand new way to experience the power of ConnectAndSell right on your phone, anytime anywhere. 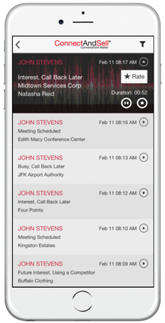 It allows you to listen to and rate your reps recorded conversations whenever and wherever it is convenient for you, making the most of your valuable time. ConnectAndSell for iOS will redefine the way Sales Leaders coach and provide feedback to their teams. Download this free app and experience it today! 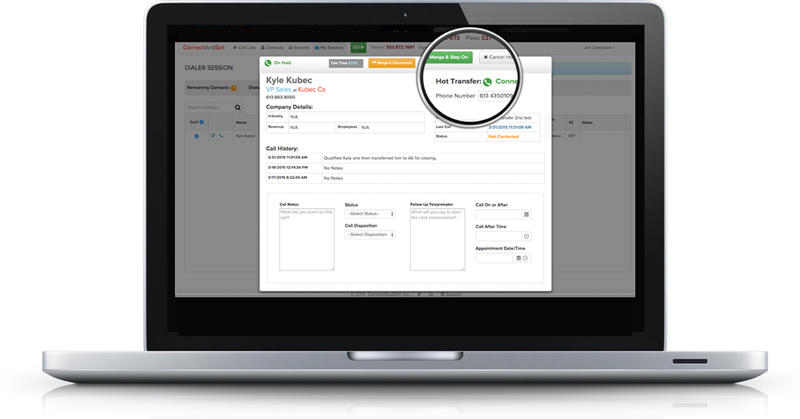 The Hot Transfer feature lets your Lead Development Reps quickly and easily transfer an interested prospect to an Account Executive for closing once the L.D.R. has qualified them. With a single button click your L.D.R. can dial out to the A.E., debrief them on the prospect and then use the 3 way conferencing option to conduct a warm handoff between the prospect and the A.E. before dropping off the call and continuing their calling session. 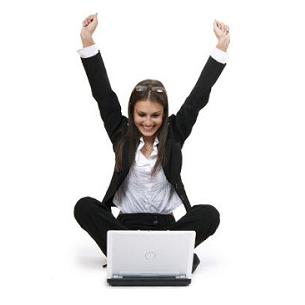 Call new leads minutes after they are submitted! Research clearly shows that the quicker you can respond to leads the better your results will be. ConnectAndSell’s Lead Injection feature optimizes response time in order to get you on the phone with new leads as quickly as possible. Unlike some other systems which merely tell you when it’s a good time to call someone ConnectAndSell will get them on the phone for you. Bad Lists? No Lists? No Problem! ConnectAndSell will never charge you for leads that do not completely meet your expectations. Every list build includes the opportunity to review and select only the leads you want from the results that we return to you. Gain the ultimate advantage in identifying and addressing gaps in key performance parameters to continually fine tune and improve. 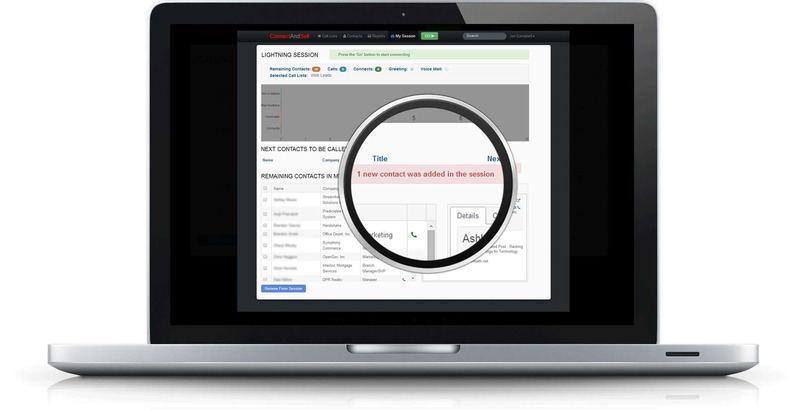 With Quick Lists creating a call list is as easy as creating a report in your CRM. Leverage our bi directional synchronization with leading CRM applications to create calling lists directly from CRM reports. The ConnectAndSell Coaching feature makes observing and coaching sales rep performance a breeze. Gone are the days of using cumbersome recording tools. 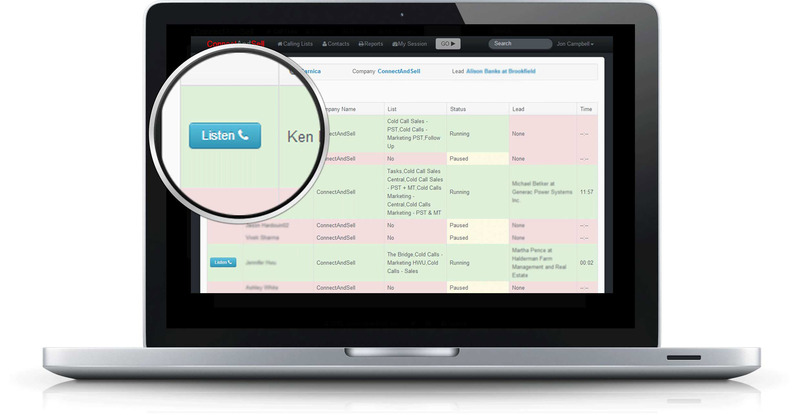 Sales Managers can simply login in to the Coaching feature when their reps are using ConnectAndSell and click Listen! 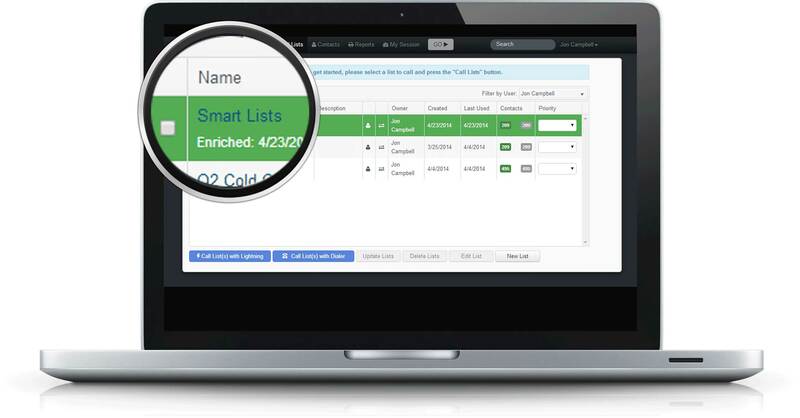 Smart Lists help managers guide their reps calling efforts by identifying which list should be called when. Take the guess work out of calling by prescribing what list should be called at any given time. With contributions from over 25 of the world's greatest sales professionals of our time. © ConnectAndSell Inc. All Rights Reserved.